Maria Montessori watched the child. It was the child’s development and learning that dictated her choice of materials. She tested her materials, keeping only those that held the child’s attention and provided learning experiences. She prepared and re-prepared the classroom environment until she developed the basic materials used in Montessori schools today. Of particular interest are her math materials. The logic, concreteness, and absolute simplicity of these materials reveal Maria Montessori’s genius. (And indeed, she was discovered as a child to be a math genius). These are the principles followed throughout the Montessori curriculum. 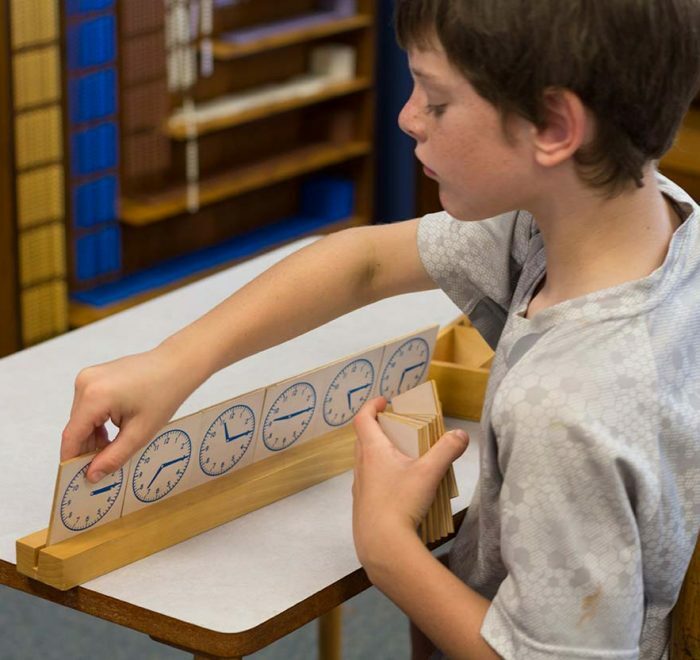 Starting in practical life, precision is emphasized – recognized as a math readiness skill. The child is measuring as he pours water, and is estimating distance with sweeping exercises. Then, in the early sensorial materials, he uses TEN cubes to show size, TEN long rods for length, TEN cylinders for depth, and so on. The child’s mind is being prepared for the decimal system through his eyes and movement. When the child reaches actual counting, he is already familiar with TEN-ness. He then learns the four basic mathematical operations through the use of concrete materials. In the traditional approach to education, as the child begins his/her elementary schooling, the child is given individual concrete’s and abstractions with no tie to a unifying principle. Because of this disconnectedness, the child has a more difficult time understanding the concepts being presented. In the Montessori elementary classroom, the child is first presented with a universal view. Then information is broken down further and more and more detail is provided. By integrating information at every stage with a universal view, a context is provided to the child so that he can more easily absorb each new lesson. For example, when a child studies the concept of gravity, she can relate back to previous lessons studying the solar system and the forces keeping the planets, moons and other bodies in their orbits. This unifying concept can be found throughout the curriculum in the Montessori classroom. The order of the classroom arrangement and nature of materials used in the child’s exploration should accurately reflect the nature of the universe in which humans exist. The teacher serves as a link between the child and the prepared environment. Lessons are presented in an order that first exposes the individual to the whole of the universe with the purpose of stimulating interest and questions, and then guides the child in his search for answers. The teacher constantly observes the children, assessing where they are in their individual development, and keeps records of their activities. These records are a tool by which the teacher can monitor the progress of the individual, and plan follow-up presentations to stimulate further progress. The child in the classroom is granted freedom provided she demonstrates respect for people and the materials within the school environment and takes responsibility for following class rules. This structured freedom provides opportunities for the child to experience self-directed activity, acquire knowledge first hand and experience the inner joy resulting from the mastery of specific skills. This sense of efficacy is what leads to self-esteem. 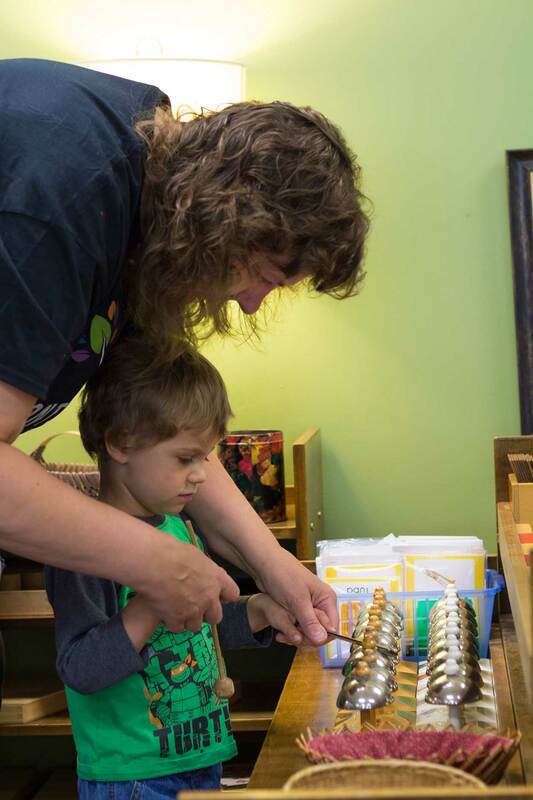 To learn more about the Montessori Method, please call our office or schedule a tour. We would love to let you observe our children at work, and answer any questions you may have.